There is a burnished look to the place where I live, in this late winter August. 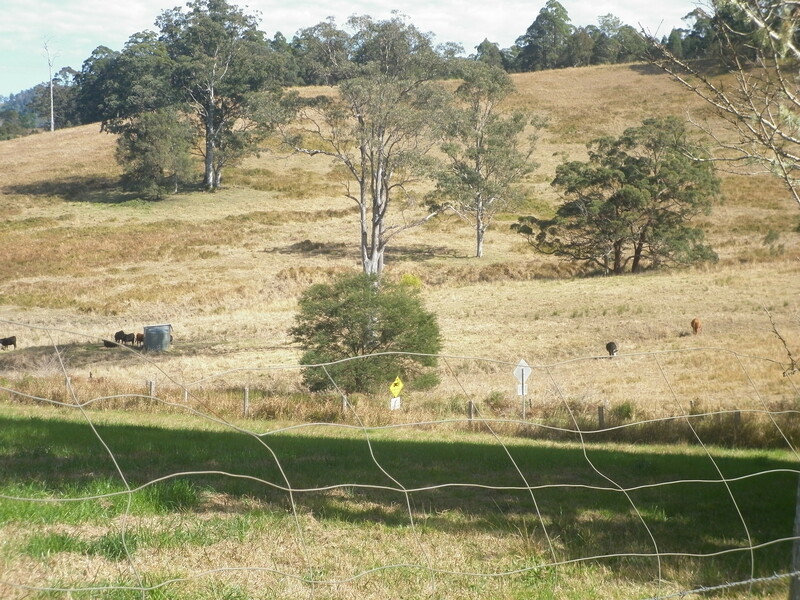 A series of frosts, followed by a week of wind has given a bronzed sheen to the farmland surrounding us. August was my least favourite month when I was a kid. Cold, dry and windy; the wind would blow relentlessly day and night until I felt as if I couldn’t stand it any more. I thought for sure that the giant Blue Gum on the hill above our house would crash onto the roof, killing us all…midnight anxiety in a wind storm! I don’t mind August so much now. Every season has its time, and its place. There is still beauty, if you know where to look for it. 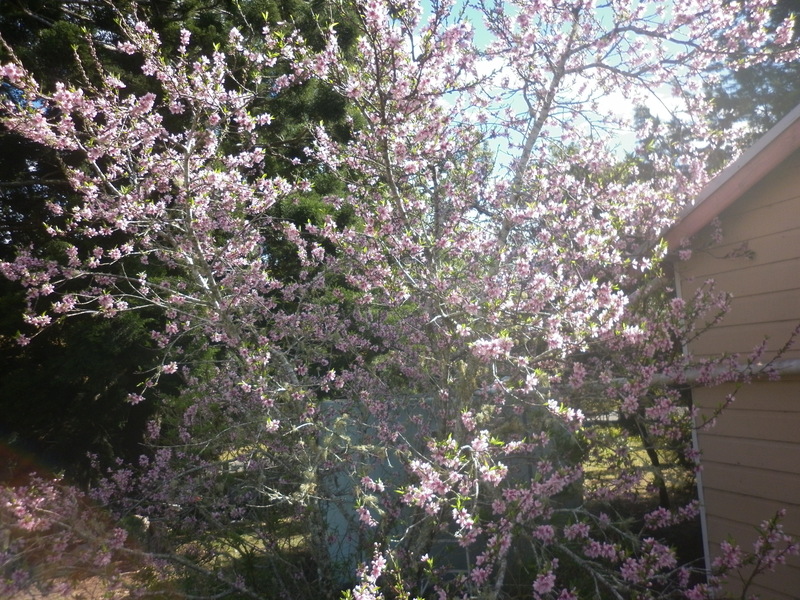 Outside my yoga room, the peach tree is alight with delicate pink blossoms. 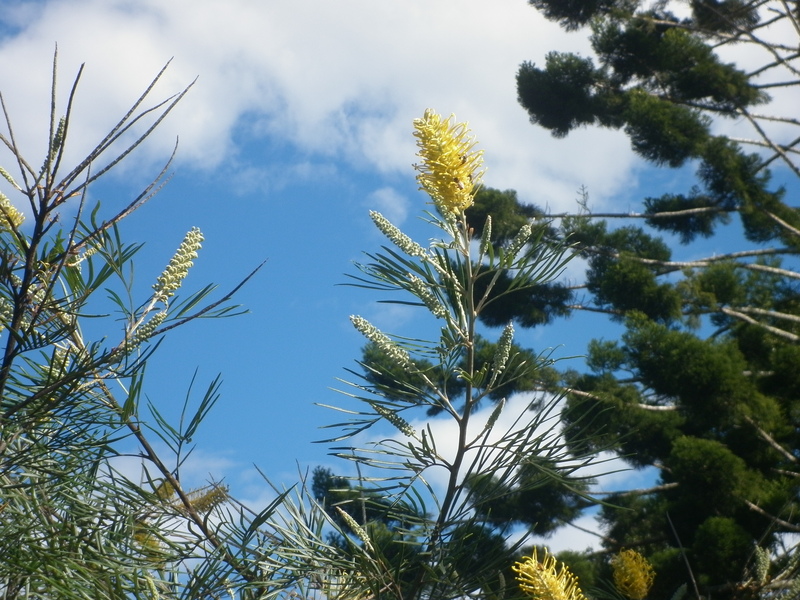 The grevillea is glowing golden in the sun. 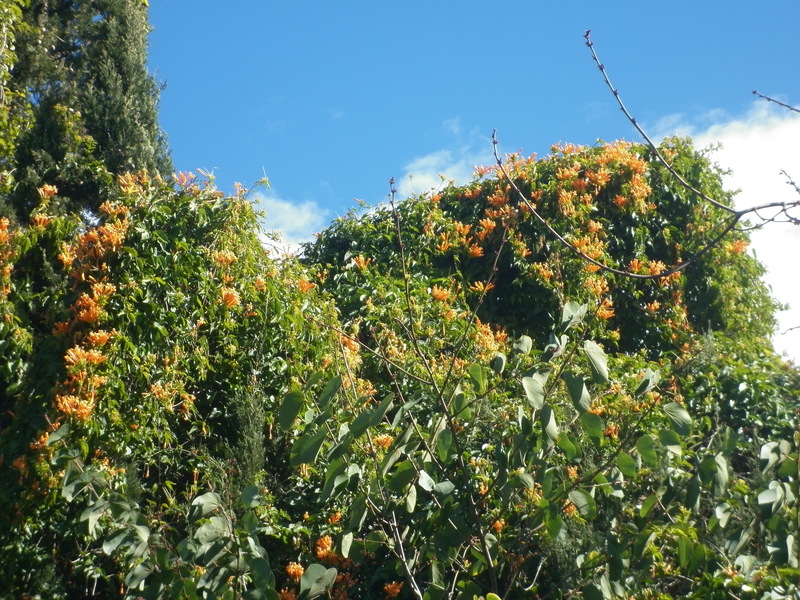 The elongated flowers on the orange trumpet vine stand in vivid contrast to the evergreen spruce over which it climbs. Life ticks over. There is a strange breathlessness, a silence, a waiting. Nature knows spring is coming, and it needs this cold, dry, barren period to rest before the busyness of Spring and Summer. I feel like that too. There is a push-me pull-you feel to the days, although when I remember to be mindful , I can slip in between the push and the pull and rest there. Mostly, my life at home keeps me entertained. I read and write, research and study, cook and clean, play with, hang out with and serve the Fairy Queen, who must be obeyed above all else (she thinks!). I realise today, surprised, that the things that I thought essential six months ago are not even desirable now. My family, once a source of great frustration and friction, has become my refuge and haven, a place peopled by loved ones who are experts at understanding and loving me unconditionally. This seems exceptionally comforting and nurturing to me now. It is my experience with life and its cycles, that we are given these periods of rest for a reason. There is a strict requirement that we use these times for restorative purposes. It is not useful I’ve found, to buck and chafe and complain in these times, as much as we only feel like we are useful when we are on the go. Guess what? If we don’t rest, we aren’t useful to anyone. 1. Nothing will change or happen until we have sufficiently rested and the Universe will be the judge of when that is, thank you very much. 2. You get sick – then you’ll have to rest. Look around, you see it all the time. 3. Our busy cycle will start again, and we won’t be properly rested because we will have wasted our resting time wanting to be busy! Fancy. The Bear told me today that I am particularly good at understanding cycles. I guess I am. I like patterns. I like to watch and feel my way through life, gleaning insights and understanding as I go. I like the rhythms of life; the seasons, my menstrual cycle, moon and planet cycles, equinox and solstice. It is comforting to feel as though I am part of a bigger story – that while change is inevitable, it is bearable if it is enveloped within a cycle, and understood through one as well. Do you observe the cycles within your life too? Do you rest when the universe tells you to, or do you have to be forced? It’s so fascinating for me to read your article because August is so different up here in the northern hemisphere. I was born in August, a time when summer is usually still going strong and intensely warm. I’ve fetl the opposite when we have had a few cooler days in the last week, giving us a sense of the autumn and winter that are coming for us. We had a very hot and dry summer with drought like conditions across much of the United States. Even without this year’s heat, I’m usually getting tired of summer by August. Thanks for helping me to experience August from a new perspective! We get very used to how the world is around us don’t we? It seems equally strange to me that you would be at the end of summer now 🙂 I love the global perspective of blogging, don’t you? p.s. You lucky girl. What a view!! !